Bandwidth manager to be installed on a recycled older WIN XP gateway computer located between router and LAN network switch. 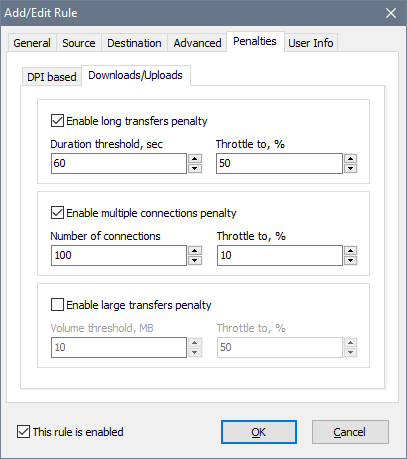 Can bandwidth manager be installed on the gateway computer and configured to dynamically equally share the available bandwidth among 25 users, irrespective of protocols or internet activity? If 2 users active then each gets 50%, if 3 users then 33% each, if 4 users then 25% each. If this is possible, please provide config instructions. What would be the minimum memory size & CPU speed requirements? The software implements the so-called round-robin algorithm, which should automatically provide more or less equal distribution to every user. As to CPU and memory requirements, for 25 users pretty much anything will do (like 1 Ghz CPU and 512 MB RAM). Sorry to intrude, I'd like to know more about the multiple connections penalty. Does the number of connections relate to how many ip's (machines) are utilizing bandwidth? or the actual number of connections the single IP is accessing? Is the connections only counted if it's in the rules? And does the rules separate upload and download? If these packets have been seen in the last 5 seconds, the core would assume there are 3 connections. Obviously this value is changing all the time. So if I had for example 10 machines with a 20mb connection. Is it safe to set them at 10 connections with 10% throttle? I will test it out. If these ten machines are processed by one rule, it's not a good idea, they will be shaped at 10% most of the time. You'll probably have to experiment with the numbers to find those that work well.